Plenty of area boys basketball teams provided seasons to remember in 2018-19, including a pair of schools in New Britain that ended their seasons at Mohegan Sun Arena fighting for a state championship. With two local schools having played on the biggest stage of the season, the 2018-19 All-Herald Boys Basketball Team is loaded with undeniable talent, while plenty of other athletes from other schools in the area provided memorable performances to warrant an inclusion. Innovation didn’t just end its season with a state championship trophy after taking down Old Lyme in the Division V state tournament final, it also headlines the All-Herald First-Team with a pair of dynamic scorers that also dominated on the defensive end in senior Lenny Okonya and junior forward LJ Hazelwood. Okonya earned an All-State honor thanks to averaging double-digits in both points and rebounds for the season, finishing with a clip of 13.5 points and 10.1 rebounds per game. Okonya was also the leading vote getter for the CRAL All-League Team, as his defense was just as dominant as his offense. The senior’s 4.6 blocks per game made him the third-best shot blocker in the state, which he put on display in the state title game with four rejections to pace the defensive takeover by the Ravens. Hazelwood’s season was highlighted by an All-State selection as well. Paired with teammate Carlos Gonzalez on the CRAL All-League second-team, Hazelwood was what head coach Matt Lance considered to be a “quiet double-double machine,” averaging double-digit points and rebounds for the season, and his monstrous third quarter in the state final, where he dropped 10 points, put the game away for Innovation. Okonya and Hazelwood were the first ever players from Innovation to be named All-State in boys basketball. The Hurricanes came up just short in their quest to bring a boys basketball state title back to New Britain High, but the team still put together one of its most successful seasons in decades thanks to top performers like seniors Isaiah Jenkins and Maurice Turner. Battling in the Hurricanes’ first state title game since 2002, Turner dropped a game-high 19 points to keep New Britain within striking distance until the final minute of the game against top-seeded Waterford. His 14 points in the state semifinals against No. 2 Glastonbury were also a team-high. The exclamation point in that game came from Jenkins, who scored a driving layup to give New Britain its largest lead of the game in the closing minutes of the fourth quarter. Jenkins also provided a huge 3-pointer in the state quarterfinals against No. 3 Wilton, finishing with 10 points to help the Hurricanes pull off one of their most thrilling victories of the year. Rounding out our first-team is Berlin senior Holden Murphy, who did all he could to keep his team’s season alive in the second round of the Division III state tournament when he scored a team-high 25 points in a losing effort to Amistad. The team captain played like one all season, averaging 21 points and five rebounds per game, helping him earn all-CCC honors. Murphy also attacked the books like he did the rim, which landed him on the CCC All-Academic Team. 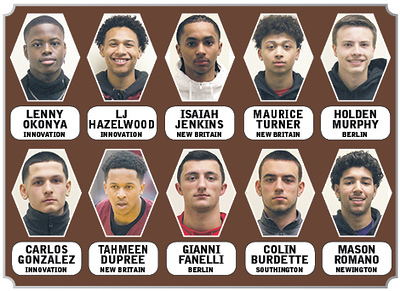 New Britain and Innovation also highlight our second-team, with the Ravens being represented by senior point guard Carlos Gonzalez. One of the most active defenders on a Ravens team that prided itself on defense, Gonzalez was also one of the team’s most efficient 3-point shooters, and knocked down a clutch trey at the first quarter buzzer in the state championship to turn a 10-9 deficit into a 12-10 lead, sending the Ravens on their way to glory. Gonzalez entered the postseason on a tear, scoring 22 points in the regular season finale before dropping 15 in the opening round of the CRAL Tournament, sparking Innovation to its second conference title in as many years. Gonzalez’s efforts on both ends of the floor led to an inclusion on the CRAL All-League second-team in 2019. New Britain’s last entry for our All-Herald team is junior Tahmeen Dupree, who makes the team for the second straight season. Dupree earned all-CCC honors and sank two of New Britain’s biggest free throws of the season in the semifinals against Glastonbury, which put the Hurricanes ahead by three in the game’s final seconds. The only Hurricanes starter who won’t be graduating this spring, Dupree will be leaned on heavily by head coach Kurt Reis next winter. Berlin will also be losing a lot of senior talent, as Gianni Fanelli will join Murphy in graduation this June. Fanelli makes our list because of his incredible ability to come through in the clutch this season, knocking down a pair of buzzer-beaters against Middletown exactly one month apart from each other. Fanelli averaged 19 points per game and four steals, leading to a second straight all-conference selection and a spot in the 2019 Senior Basketball All-Star Game. Fanelli made a mark on Berlin basketball, but still has spring to compete on the diamond, where he’s also been an all-conference selection two years in a row, and has signed a National Letter of Intent to play baseball at Assumption College next fall. Back in February, Fanelli scored 17 points to lead the Redcoats past Southington in the first round of the CCC Tournament, where the Blue Knights received a team-high 11 points from senior Colin Burdette, who represents Southington on the All-Herald team. Burdette, another selection to the all-CCC team, led the Blue Knights on a fourth quarter comeback against Glastonbury in the state tournament behind seven points in the first three minutes in the final period. While the Tomahawks settled in and eliminated the Blue Knights, Burdette was once again leading a charge like he did down the stretch of the regular season, where he helped Southington win 12 of its final 14 games to make the state tournament. Burdette also got it done in the classroom, where he is an honor roll student and will be attending Marist in the fall. He plans to try and make the school’s basketball team as a walk-on. Newington earned a win in the Division II state tournament that included Southington and New Britain, and forward Mason Romano was all over the Indians’ victory over Darien. The junior led the way with 26 points, which was status quo for much of the season, making him an easy choice for the All-Herald team. Romano averaged 18 points per game this season along with seven rebounds, which was plenty to put him on the all-CCC team. Newington came up short in the second round of the state tournament in a close loss to Amity, but Romano already has a state title to his name thanks to his contributions to the Indians’ dominant volleyball program, which will be going for its third straight championship this spring. Romano will be back on the hardwood as a senior next winter, and will likely be one of the most reliable scorers in the area. Posted in New Britain Herald, Berlin, Goodwin Tech, Innovation, New Britain, Newington, Plainville, Southington on Friday, 5 April 2019 20:56. Updated: Friday, 5 April 2019 20:59.